History, development, service, specifications, statistics, pictures, video and 3D model. The tailless Gotha Go 229 V2 at Oranienburg, probably in February 1945. Gotha Go 229, Horten Ho IX. Type: German jet bomber, jet fighter-bomber and jet fighter. The Horton Ho IX twin-jet tailless fighter-bomber, from which 2 prototypes have been flown prior to the end of the WW2, had been an incredibly superior model, which takes advantage of extensive knowledge acquired by the brothers Reimar and Walter Horten within the design flying-wing planes, of which the bulk were gliders. Beginning in 1942 developed by Sonderkommando 9, the initial model Ho IX VI was discovered to be incapable of provide the 2 planned BMW 109-003-1 turbojets because of an unexpected rise in power plant size, and it was consequently flown as a glider at Oranienburg through the summer of 1944. 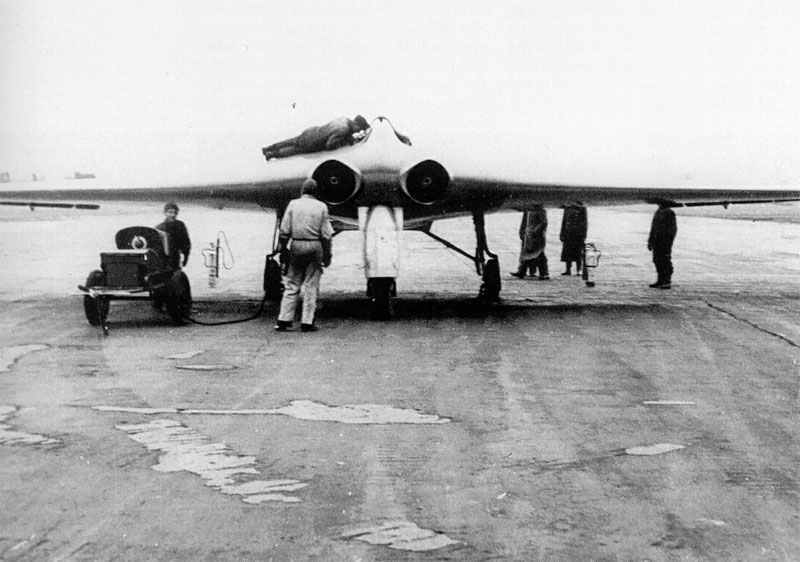 The newly designed Ho IX V2 was equipped with 2 Junkers 109-004B-1 turbojets and flown properly at Oranienburg, showing speeds as high as 960 km/h (597 mph) prior to being demolished while making a single-engine landing. This kind of promise motivated the RLM to instruct Gothaer Waggonfabrik to assume development of the design, and a new third prototype, the Go 229 V3, was designed with 1,000-kg (2,205-lb) thrust Jumo 109-004C turbojets, but was held back from flying by the end of the war in May 1945. A photomontage with a model of the Gotha Go 229. Work had also began on the two-seat Go 229 V4 and Go 229 V5 night-fighter prototypes, the Go 229 V6 armament test prototype, and the Go 229 V7 two-seat trainer. No progress had been done on twenty pre-production Go 229A-0 fighter-bombers, on order by the end of World War 2, which were developed to be armed with 2 x 1,000-kg (2,205-lb) bombs and 4 x 30-mm MK 103 cannon. Tagged 1945, fighter-bomber, germany, jet, luftwaffe.